At a recent meeting, the Piedmont School Board set a horizon of 2016 before going back to the voters with a new bond measure should the community decide on a new renovation or reconstruction plan for the Alan Harvey Theater. I believe that it is worthwhile to reflect on the past to draw lessons for the future. The first is about capital project financing. Looking back, the proposed theater renovation could have been obtained for free. Yes for free! Let me explain. 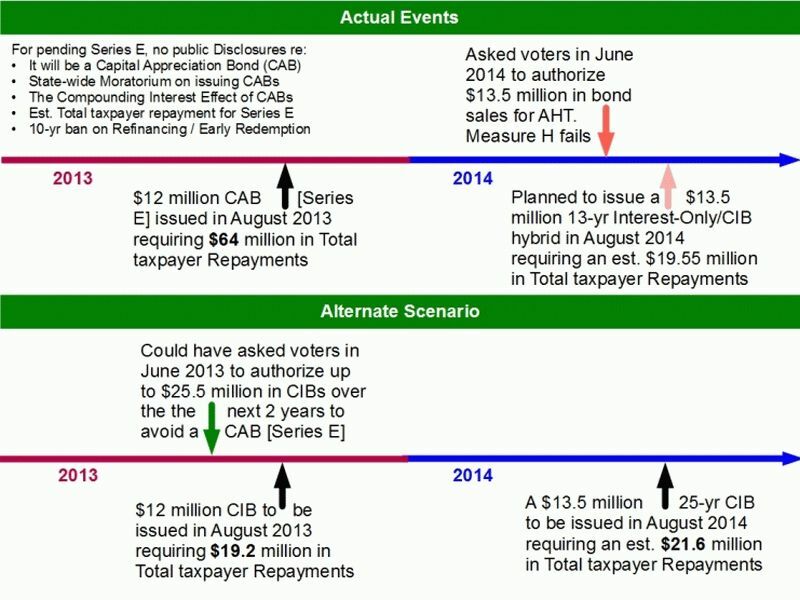 In August 2013 the District issued the Series E CAB bonds to refinance a $12 million short term note due in 2014. These bonds require Piedmont taxpayers will pay back $64 million over the next 30 years. At that time the School Board, the District and the District's financial adviser explained there was no alternative to issuing the Series E bonds under the 2006 voter authorization because it's statutory limit of $60 per $100,000 assessed valuation had been exhausted. There was an alternative which was unfortunately never considered: Get a new voter authorization to finance the $12 million with a Current Interest Bond (CIB). Using a mortgage analogy, a CIB is like a fixed rate mortgage that requires amortizing repayments to be made starting immediately. The 2006 voter authorization had already used up its $60 limit. However a new voter authorization would allow a new $60 per $100,000 assessed value (AV) statutory limitation even if only a portion of that limitation would be needed. Refinancing the debt as a CIB would have saved about $44 million compared to the Series E CAB. A CIB would require paying $227 for a $ 1 million home (AV) starting immediately and save money long term. Alternatively the voters could turn down this hypothetical measure and accept the drawback of the Series E bonds: no payment now for 13 years but a burden on future Piedmont homeowners or heirs. This trade-off should have been the core of the campaign in favor of this measure. Now an even better alternative should have been considered: Instead of going back to the voters for $12 million separately, it could have been an option when asking voters for the $13.5 million AHT renovation. Borrowing a combined $25.5 million as a CIB would have saved $24 million over 30 years relative to the total repayment cost of paying back $64 million for the Series E bonds. The AHT renovation would have been “free” from a total repayments POV. For more details see the companion article: http://HariTitan.com/article/free-aht.